Updated January 15, 2019 - PolarAlignAP version 2.6 is currently waiting for review and should be available in a few to several days. 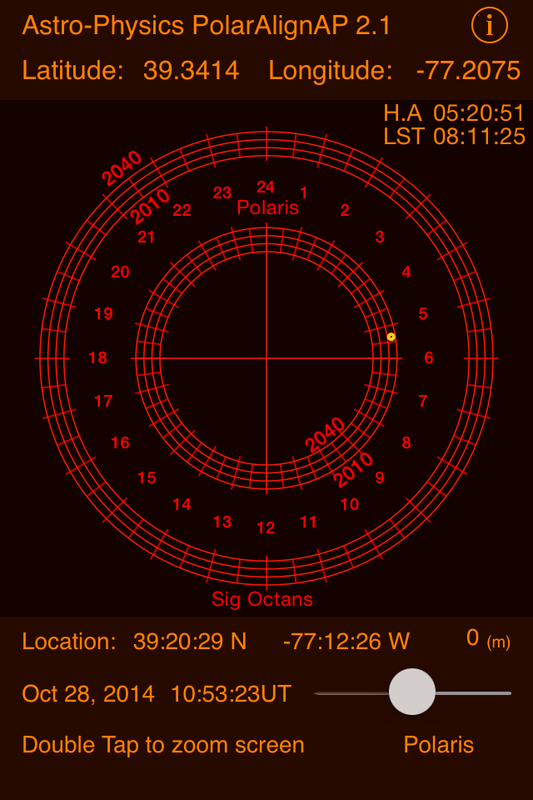 PolarAlignAP is used as a reference to help polar align an Astro-Physics corrected right angle polar finder scope. PolarAlignAP uses iPhone's Location Service to obtain your current latitude and longitude although they can be entered manually if Location Services are turned off. The screen shows the position of Polaris if you are in the Northern Hemisphere or Sigma Octanis if you are in the Southern Hemisphere. It also displays your latitude, longitude, altitude and the Universal Date and Time.